(Phys.org) —Having the photoreceptors at the back of the retina is not a design constraint, it is a design feature. The idea that the vertebrate eye, like a traditional front-illuminated camera, might have been improved somehow if it had only been able to orient its wiring behind the photoreceptor layer, like a cephalopod, is folly. Indeed in simply engineered systems, like CMOS or CCD image sensors, a back-illuminated design manufactured by flipping the silicon wafer and thinning it so that light hits the photocathode without having to navigate the wiring layer can improve photon capture across a wide wavelength band. But real eyes are much more crafty than that. A case in point are the Müller glia cells that span the thickness of the retina. These high refractive index cells spread an absorptive canopy across the retinal surface and then shepherd photons through a low-scattering cytoplasm to separate receivers, much like coins through a change sorting machine. A new paper in Nature Communications describes how these wavelength-dependent wave-guides can shuttle green-red light to cones while passing the blue-purples to adjacent rods. The idea that these Müller cells act as living fiber optic cables has been floated previously. It has even been convincingly demonstrated using a dual beam laser trap. In THIS case (THIS, like in Java programming meaning the paper just brought up) the authors couched this feat as mere image transfer, with the goal just being to bring light in with minimal distortion. Fireflies, in trying to get light through their cuticle, face a similar but opposite challenge—namely, getting light out. Their fascinating solutions to transparency and index matching are an illuminating read. In the retina, and indeed the larger light organ that is the eye, there is much more going on than just photons striking rhodopsin photopigments. As far as absorbers, there are all kinds of things going on in there—various carontenoids, lipofuscins and lipochromes, even cytochrome oxidases in mitochondria that get involved at the longer wavelegnths. Speaking of the mitochondria, one of their most incredible adaptions in the eye came to my attention recently courtesy of O.R. Pagan, author of a cool book about planarians. His blog mentions how these creatures have convinced the endosymbiont microbes in their eyes to accumulate refractive proteins and tightly pack together. After swelling to several times normal size like a liver about to become foie gras, these mitochondria are transformed into a lens about to focus light onto sensitive cells. 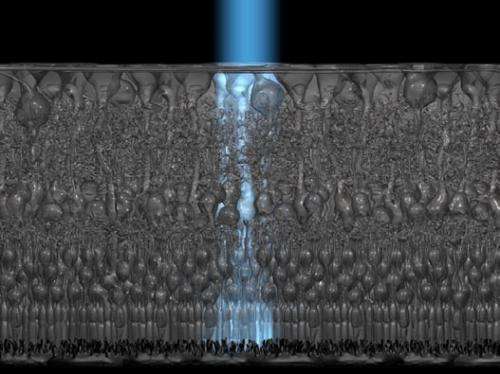 In considering not just the classical photoreceptors but the entire retina itself as a light-harvesting engine, it seems prudent to also regard its entire synaptic endowment as a molecular-scale computing volume. In other words, when you have many cells that have no axons or spikes to speak of, that can completely refigure their fine structure within a few minutes to handle changing light levels, every synapse appears as an essential machine that percolates information as if at the Brownian scale, or even below. By contrast the brain itself, while containing much the same, appears not quite so tightly strung. That's not to say that wiping out swaths of cherished synaptic meat memory in the brain would be on par with taking down a few tubules of kidney, lobules of liver, or osteons of bone, it's just the retina seems even more brain-like than the brain itself. The retinas of different animals clearly employ different tricks. Some reflect incoming light back out through the retina for a second look. Others can detect things like polarization or even angle of incidence. Most incredibly, like the wings of a swallow, the retina more-or-less works right out of the box, even if it has not seen any exercise. In seeking to understand how it then further refines its delicate structure we should perhaps not overlook the pervasive organizing influence of the incoming photons themselves. Now that it is becoming abundantly clear that the whole works can "feel" them, the next question to answer is how. Vision starts with the absorption of light by the retinal photoreceptors—cones and rods. However, due to the 'inverted' structure of the retina, the incident light must propagate through reflecting and scattering cellular layers before reaching the photoreceptors. It has been recently suggested that Müller cells function as optical fibres in the retina, transferring light illuminating the retinal surface onto the cone photoreceptors. Here we show that Müller cells are wavelength-dependent wave-guides, concentrating the green-red part of the visible spectrum onto cones and allowing the blue-purple part to leak onto nearby rods. This phenomenon is observed in the isolated retina and explained by a computational model, for the guinea pig and the human parafoveal retina. Therefore, light propagation by Müller cells through the retina can be considered as an integral part of the first step in the visual process, increasing photon absorption by cones while minimally affecting rod-mediated vision. Good science spoilt by bad spelling. "cutical" [sic] - Author meant cuticle. "curtsey" [sic] - Author meant courtesy. "there is much more going on then just photons striking" [sic] - Author meant than. To non-native English speakers: Do not rely on physorg to teach good grammar or spelling. Guilty as charged. Thx for taking time to point out, but once I hit submit, I can't really change. I just can't figure out how spelling comes so easy for y'all yet science so hard? I find it imperative to copy text and paste it into a different format (sometimes just a different font size or background colour helps) before proofreading. It makes mistakes jump out that I have missed countless times when just rereading the composition as originally written. Then you're a better man than I. Good tip. Reader feedback with acknowledgement! This makes it feel like our reading of your articles is worth something to the phys.org community. Thanks for responding John, even in light of the circumstances. There's always a sense of disappointment when readers can pick out blatant mistakes in articles, discuss it amongst themselves and yet there is no feedback from the posting organization.